The market is taking a step backward today after taking two steps forward in recent sessions - U.S. markets are giving some gains back Tuesday after a strong post-Thanksgiving rally. One of the most-active names in Tuesday's trading session is Advanced Micro Devices (AMD - Get Report) . AMD has been grabbing investors' attention for a while now, thanks in part to this stock's status as one of the best-performing S&P 500 components in recent years. As volatility has poured back into the market in 2018, AMD has been a bellwether of sorts for the entire technology sector. That's actually a very good thing for tech bulls. After correcting painfully since the start of October, AMD's rally looks like it's back on track from a technical standpoint - and that could be setting the stage for higher ground in the final stretch of the year. 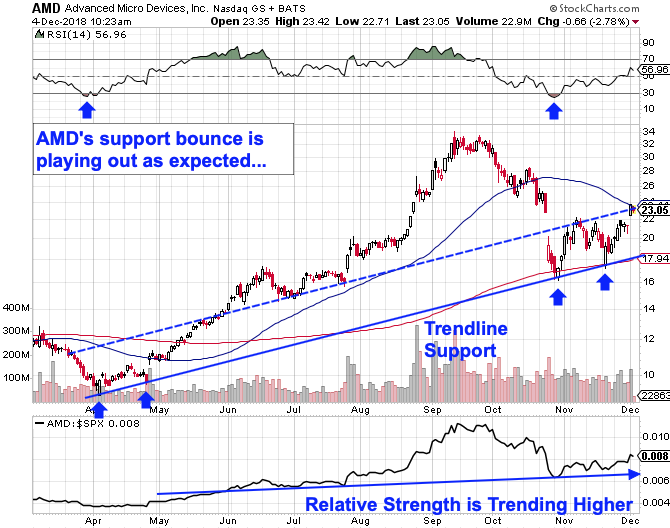 To figure out how to trade shares of AMD from here, we're turning to the charts for a technical look. The big takeaway from the last time we took a look at AMD still holds: Context is key to evaluating the correction in this stock. While AMD may have shed around 35% of its price tag between the start of October and the end of November, shares were still up nearly 80% in the 12 months leading up to Thanksgiving. That makes the depth of this stock's correction look less jarring. Now, shares are up even more, thanks to a pretty textbook bounce off of trendline support. Shares caught a bid at support for the fourth time at the end of November, and they've managed to rally up to the top of their high-probability range. That doesn't necessarily mean that shares are likely to face significant pressure from here; the trendline resistance level on AMD's chart is much less substantial than trendline support has been. From a risk-management standpoint, risk-averse traders who pulled the trigger on the trendline bounce in AMD might consider taking some gains off the table here. But for most AMD longs, the affirmation of buying pressure at trendline support is good reason to keep holding shares in the long term. Relative strength continues to be one of the most important side-indicators in any trader's toolbox in this market environment. The fact that relative strength continues to bounce higher in an uptrend of its own this fall suggests that AMD is continuing to systematically outperform the broad market, even despite short-term pressure today. As long as AMD continues to hold above its 200-day moving average, it's a "buy the dips" stock.